Abstract: Periodontal research over the last 40 years has been remarkably prolific. We now understand that severe periodontitis affects approximately 10–15% of the population (representing a large number of individuals in the UK) and gingivitis and mild periodontitis affect a majority of people. Microbiological research has identified some of the key pathogens that are implicated in periodontal disease. Plaque bacteria exist in biofilms, which have evolved to protect individual organisms within the subgingival bacterial community. For this reason, root surface instrumentation (RSI) remains the cornerstone of periodontal treatment, and is necessary to disrupt the subgingival biofilm mechanically and reduce the bacterial bioburden. Clinical relevance: A good understanding of periodontal disease processes and risk factors is of clear benefit for those dentists engaged in the treatment of this condition. Author notes: Philip M.Preshaw ,BDS,FDS RCS(Edin. ),PhD, Robin A.Seymour ,BDS,FDS RCS(Edin. ), FDS RCS,PhD and Peter A.Heasman ,BDS, FRCPS,PhD,School of Dental Sciences,University of Newcastle upon Tyne,Framlington Place, Newcastle upon Tyne,NE2 4BW,UK. 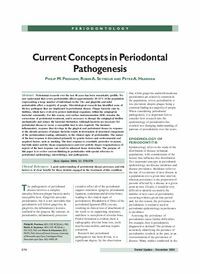 Objective: To explain current concepts of periodontal disease epidemiology, histology, pathogenesis and risk factors.